Is it ok if you post the transcript online? Thanks! This in an important topic. Thank you for posting it, Bhante. In my five years of on-again/off-again practice, I have found metitation frustrating or not helpful and have been guilty of throwing the baby out with the bathwater. 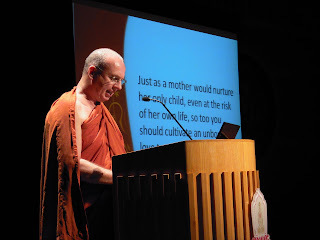 This talk is a good reminder not to give up on the Dhamma nor discount the other six parts of the path. Indeed, I have experienced more happiness and joy practicing real-life metta and Dana than I have every derived from only meditation. I know that meditation is important and I continue to work on that. It's good to hear your voice! I remember somewhere in the Sutta-pitaka, the Buddha says the Dhamma practioners MUST practice Metta. It seems, somewhere in the Anguttara-nikaya as you mentioned in your talks? Could you help point to the Pali source, Bhante? Thanks! "he did not teach the Noble 1 fold path"
I wish they would invite you to more places to deliver Lectures. Even i like some others, have Experimented More on Samatha Meditation Types, found it quite an Exiting Experience and when i tried to Simulate it again could not get it, Finally realising that I am Craving for one type of sensation. My Mistakes have not Ceased even now, where iam trying to attach more importance to Vipassana & Mindfullness. Your Lecture is a Good food For thought. However i feel in India since there are many Hindus, in genral Lay people of all religions naturally tend to attach less Importance to Aspects of Mediation and more on the other Rights , such as Right Livley hood, Right Speech , Right Action etc. This is Precisley the Reason why i see in Goenkajis Retreats they insists on Practise & More Practise. the mp3s can't be found anymore..are there any alternative sources ? I was also looking for the lecture in mp3. I thought it was very interesting the first time I heard it. Hope to be able to listen to it again.